We represent our experiences linguistically by packaging information into clauses. As such, clauses can be considered to be the key unit of grammar. They are units of information structured around a verb phrase (VP) and, according to some theories (e.g. Systemic Functional Theory), a basic clause must consist minimally of a Subject and a verb. Using a different descriptive approach, however, clauses may be described in terms of processes (what is going on), participants (the person(s) or thing(s) involved), and the circumstances accompanying the process (see What Do We Talk About?). Using this descriptive approach, a basic clause must consist of a process and at least one participant. There are several exceptions to the above claims but space does not allow a more detailed discussion. The interested reader is referred to the work of Biber, Conrad and Leech (2002). English syntax generally follows a Subject-Verb-Object (SVO) order. Consider the following example. We see that the Subject of the clause (the thing or person performing the action) is the boy; the Verb, which describes the particular action, is hugged, and the Object (the thing undergoing the action) is the dog. This clause can, therefore, be represented as follows. We have also noted how both the Subject and Object are represented by noun phrases and that the Verb is represented, as it must always be, by a verb phrase. Further examples of the basic SVO structure include the following. The basic SVO structure of English syntax can be modified in a number of ways but there are two main methods. The first is to remove or replace a functional element and the second is to add another functional element to the three-part structure. The basic Subject-Verb-Object structure can be reduced to produce a clause with the structure Subject-Verb (SV), e.g. A point to note here is that some verbs may take an Object, and thereby be expanded into the basic SVO structure, whereas some may not. Consider the first example Anila kicked. This SV structure could be expanded into an SVO structure as follows. Similarly, the second example my mother is drilling could also be expanded into an SVO clause, e.g. Verbs such as kick and drill that are capable of taking an Object are referred to as transitive verbs. However, not all verbs are capable of taking an Object. Consider the verb laugh in the third example the girl laughed. It is not possible to expand this utterance into an SVO structure, e.g. It is evident that this utterance is syntactically incorrect because laugh is incapable of taking an Object. Similarly, the verb go in the fourth example Li Wei went is also not capable of taking an Object. So, for example, the following construction is also syntactically incorrect. Verbs such as laugh and go that do not take an Object are known as intransitive verbs. The Object in the basic SVO structure can be substituted by an Adjunct that supplies further detail about actions, events and states. Adjuncts are most often optional elements that provide information related to manner, time, location or cause. Consider the following. We noted earlier that Adjuncts may be represented by adverb phrases, noun phrases and prepositional phrases. From the above examples, the Adjunct of manner in the small child cried very loudly is represented by the adverb phrase very loudly. Further examples of Adjuncts represented by adverb phrases include the following. From the previous examples, the Adjunct of time in my friend left that evening is represented not by an adverb phrase but by a noun phrase, that evening. Further examples of Adjuncts represented by noun phrases include the following. The Adjunct of location in Sarah lives in America from the earlier examples is represented by a prepositional phrase, in America. Further examples of prepositional phrases functioning as Adjuncts include the following. There is a fundamental difference between an Object and a Complement. 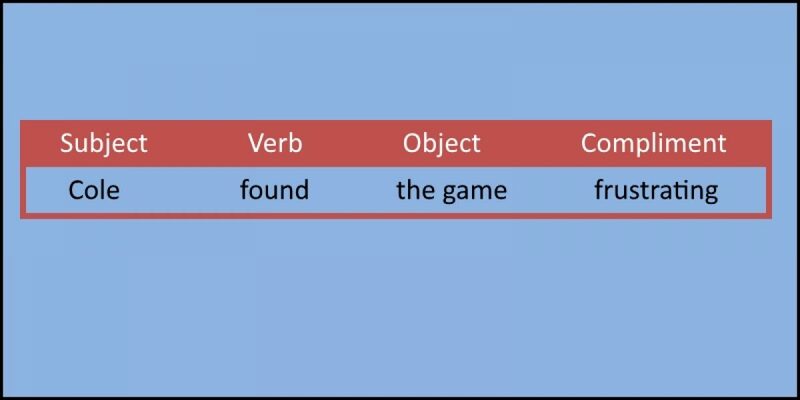 The difference is that the Subject and Object refer to different things whereas the Subject and Complement (in a SVC clause) refer to the same thing. Consider the following. In this clause, the Subject refers to one thing (Julie) and the Object refers to another thing (the cat), i.e. they are not the same. In contrast, the Subject and Complement refer to the same thing, e.g. In this clause, the Complement (happy) makes reference to the same thing as the Subject (Dawn), i.e. it is Dawn that is happy. Other examples include the following. Again we see that the Subject and Complement refer to the same thing, i.e. the witch is the ant, Adam is the hero, Kathryn is the dentist. In each of these examples, the Complement is represented by a noun phrase made up of an identifier and a head noun (an ant, a hero, the dentist). In each of these examples we see that the Object and the Complement refer to the same thing, i.e. it is the game that is frustrating and not Cole that is frustrating; it is Rupinder who is ill and not the mussels, and it is the room that is dark and not Duncan. As well as adding a Complement to the fundamental SVO structure, we can also add an Adjunct. Recall that Adjuncts are discretionary elements that supply extra information related to manner, time, location, and so on. Consider the following. In this utterance the Adjunct function is represented by an adverb phrase that consists of just the head adverb gently. This Adjunct provides additional information regarding the manner in which the Subject, the boy, carried out an action on the Object, the dog. We now realize that this action was carried out gently. Here is a further example. In this clause, the Adjunct is again represented by an adverb phrase, this time consisting of the head adverb softly that is pre-modified by the intensifying adverb so. Once more, this is an Adjunct of manner that describes how the Subject, the man, performed the action of holding on the Object, the woman. Here are some further examples of SVOA structures. The final English clause structure involves the addition of a second Object to the primary SVO structure, i.e. SVOO. When two Objects are included in a clause a distinction is made between the direct object (Od) and the indirect object (Oi). The direct object is the thing or person undergoing an action, being talked about, and so on, and the indirect object is the person who is the recipient or beneficiary of the action. Consider the following example. In this example, the thing undergoing the action is a beautiful card, i.e. it is the card that is being given. This is, therefore, the direct object. The person who benefits from the action is her mother, i.e. the beautiful card is given to the mother. This is, therefore, the indirect object. Consider a further example. In this clause the thing undergoing the action of being sent is his love, i.e. it is Graham’s love that is being sent. This is, therefore, the direct object. The recipient of the action is Margaret, i.e. she is the one who receives Graham’s love. This is, therefore, the indirect object. Further examples of SVOO clauses are given below.